The 32nd Quarterly edition, the Field Notes Lunacy notebook comes in a 3 pack of 3 1/2" x 5 1/2" die cut notebooks. Each of the 3 notebooks have different phases of the moon from full, half or crescent revealing the embossed moon underneath. The black embossed covers are made of Neenah’s Classic Crest “Epic Black Stipple,” with a leathery finish. The back side of the notebooks feature the dark side of the moon. Inside the Field Notes Lunacy notebook contains 48 pages with a 3/16" × 3/16" rectangle dot grid on Domtar Earth Choice “Gray” 60#T paper. The corners of each page have been rounded and bound with side staples. The overall notebook measures 3-1/2" × 5-1/2". The limited edition Field Notes Lunacy notebook will only be around for a short time. 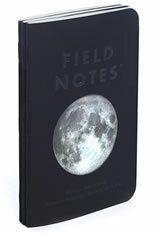 The Field Notes Lunacy Memo & Notebooks usually ships within 1 business day unless otherwise specified. Each Field Notes Lunacy Memo & Notebooks we sell is guaranteed to be genuine, authentic and will arrive brand new & unused!